The U.S. Nonfarm Payrolls Report for April finally caught up to the positive trend of the Household Survey (as discussed last month). 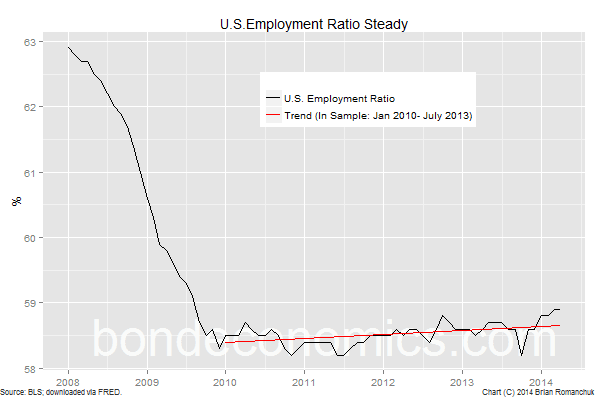 The Employment Ratio was steady at 58.9% in April, consolidating the previous uptrend. Meanwhile, the Unemployment Rate collapsed by 0.4% to 6.3% in response to the similar move in the Participation Rate (which fell 0.4% to 62.8%). I do not believe the fall in the Participation Rate is the result of demographics, rather it reflects the inherent sluggishness of the labour market. In any event, the conclusion is that these data are consistent with the economy having considerable inertia, and continuing on a steady growth path.